The other day, I outlined a few reasons why the arrival of a new Doctor is a great time to jump on board the fan bandwagon. Deep Breath didn't disappoint— it had adventure, gorgeous costumes and scenery, thrills, and a fight in the clouds over Victorian London. What's not to love? Three needed a hot shower before he felt like himself. Four tried on silly outfits. Five needed time in the Zero room. Six strangled Peri. Seven played the spoons. Eight lost all sense of who he was. Ten came out of his coma with virtually no idea what "sort of man" he was. And Twelve (briefly) abandoned Clara, scaring her out of her wits. 2. The writers and the actor need to figure out who the hell the Doctor is, all over again. Beyond the trips and trials of simple character growth, the Doctor eventually finds himself and steadies out, delivering a more consistent performance. Until then, the writers and the actor are going to be tweaking things, fine-tuning who they believe The Doctor to be. Which means that strong choices in the opening episodes won't necessarily reflect in later work. Four tempered his early goofiness with gravitas, to the point that he was unflappable. (That's not to say he lost his sense of humor.) Six smoothed out some of that arrogance and pomposity... a bit. The biggest transition, however, would definitely go to Seven. He started off as a clowning goofball, and wound up an icy chess-master. 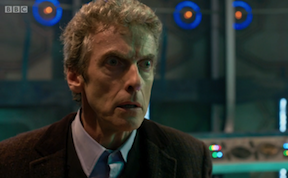 My point is this: don't let Capaldi's first performance define the new Doctor. (And it was a fine performance, in my opinion.) If this was your first episode period, stick around a bit. See where it goes from here. He's not quite done 'cooking'.